Much of the Social Media world seems to focus currently on communicating via words. In our digital information age, I find it interesting that video and audio is not as common (yet) in the SM community. It’s not that integrated with audio and video. I know that will change. Of course, digital video and audio content is easy to generate and share. That’s not my point. With words, we have a robust tool set developed over time to manipulate and manage text. Makes sense since we have been using text and publishing words for, like, a long time now. Think Gutenberg press. Lots of advancements since those days. We have adopted the written word into our behavior, cultural norms and so on. Words and the print world are internalized within us. Fast forward to the interweb. Again, lots of resource like SEO with meta and key words to aid in text searches. Great tools – for text. Not so much for video. Seen any good search tools for video lately? If you wanted to search for a specific scene, how would you describe it visually? Looking for a particular event or person in video? Today, you use words. At times, not very effective since you have to still visually insepct the images. Looking down the road, I believe we will develop the visual and audio toolbox equivalents we have for text. As we have only used video and audio for a relatively short time, advancements may take some time. But, I have no doubt it will happen. Imagine being able to edit videos as easily as you can with text files. Same for audio – seamlessly replace/insert/modify music sequences. New applications will provide the ‘Search and replace’ ability for both video and audio. The technology changes that result in easy to sue tools to manage video and audio is on its way. It will change our thinking and our language in ways we aren’t aware of yet. Think how SMS and the realted acronyms has changed our verbal and written communication styles. The same will happen for video. Perhaps, the change will occur first with audio. Much easier to deal with technically (today). The innovations needed will come from the web community. New businesses will start to offer products and services to enhance our communications both with auditory and the visual. June 4 update – Just saw this on the WP site (honest!) and wanted to share re: videopress. Will have to read (watch?) this. Some would point to Photoshop. Great tool – can do lots of things. But, complicated. I have heard people say “been using it for years; only know it a little” or “I only use what I know how to do”. A steep learning curve there. If you had to take a class to use a pencil, would you think the barrier is to high to use it? BTW, ditto for still images. Some basic tools are there and there are getitng better. It’s a long way to go to match what we have for the printed word. Life is lived in technicolor and Coldplay says ‘…I can feel the wave coming.’ I feel it. Can you envision communicating without words? Send me your visual response – I’d be happy to see it. Everybody’s talkin at me about Social Media (SM). I’ve seen all good people with lots of posts and tweets about SM ‘experts’ lately. Tangents to songs come to mind here and a nod to Neilson and Yes; but I digress. At first, I thought there are experts, are there? Well, now. Bully for them. Then it occurred to me that no, they aren’t. No one is yet. Perhaps, they are farther along the learning curve than others but not an expert (yet). Don’t be fooled by anyone who labels themselves a SM expert – not there yet. In the true sense of community, we are all learning together. We glean tips and tricks from each other, help define what is & is not accepted practice. That’s the fun part about this time, eh? Guiding, shaping and otherwise helping define how we interact and ultimately what are cultural norms. We’re making history. OK, deep breath. Goos-fraba. I read Malcolm Gladwell’s most recent book, ‘Outliers’, a while ago. In it, he defines being an expert via the 10K hour rule. The rule states that to achieve the status of expert in any given topic, it is accepted that you spend 10,000 hours working on a particular skill. Thus far, there are no Social Media experts because of the time constraint. Do the math. Even if someone spends 3000 hours a year on SM, it would take more than 3 years to reach such expert status. I’m not an SM expert and neither are you. We may be someday, once we hit 10K hours. In the meantime, we help each other learn, share, agree on many things and dis-agree on others. Willing to listen; happy to discuss. 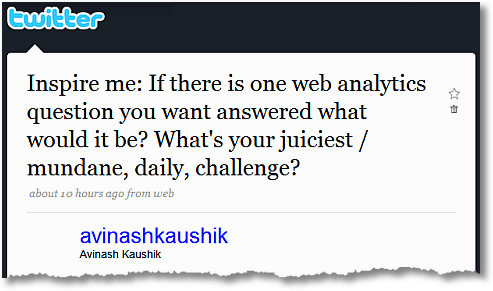 When I first started looking at Web Analytics, I found Avinash to be one of the best Subject Matter Expert (SME). He always has interesting topics to share in a way you can easily follow. Here is his recent post about twitter that talks about revenue, cost and customer satisfaction. If what you are doing does not relate to those three, why are you doing it? I like simple and this is a simple as it gets. If you had 1 Q on web analytics, what would it be?